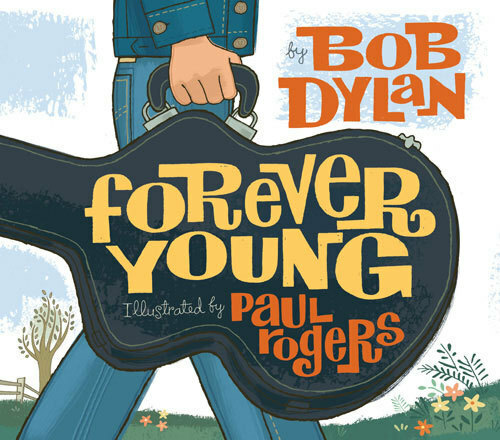 I’ll be signing copies of ‘Forever Young’ in the Ljubljana Barnes & Noble on Saturday at 10 am. If you’re in Slovenia this weekend, stop on by. 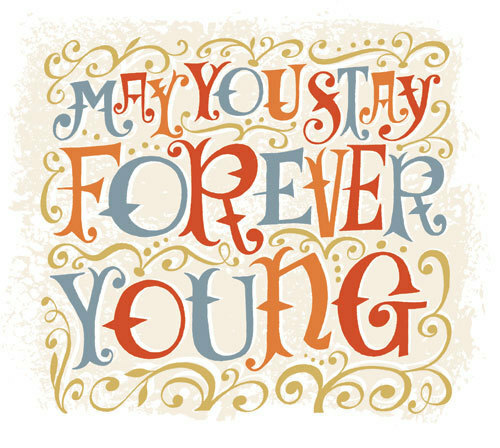 Forever Young is in the stores. 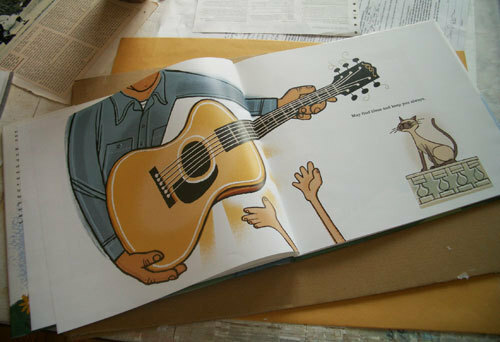 Illustrating a book for kids that takes one of Bob Dylan’s most loved songs was a challenge. Ginee Seo and Ann Bobco at Simon and Schuster laid this story on me that parallels the lyrics, and brings to it a narrative line that fits and isn’t too corny. My idea was to bring elements from Dylan’s life and lyrics from other songs to the book. 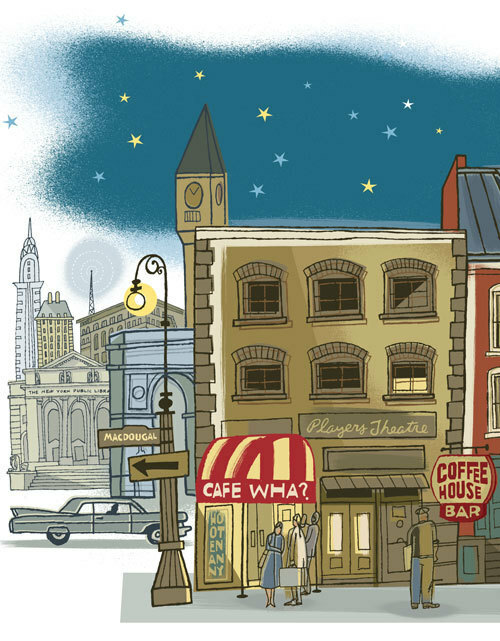 I set up the illustrations as sort of stage sets, New York City became a character in the book, and I squeezed in as many references as I could without being obnoxious. This book is for children and their parents, and I also wanted to make a book that Dylan fans would enjoy. 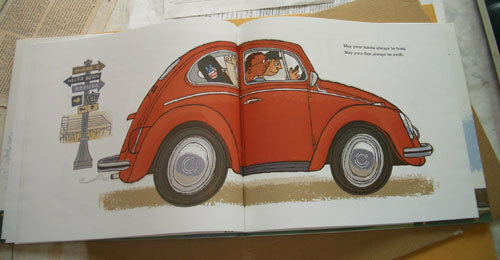 This is the first illustration I did, and it set the tone for the look of the book. We sent this to Dylan for approval, he had seen the book I did with Wynton Marsalis, “Jazz ABZ,” and picked me to be the illustrator for this book. There was really no need for us to get on the phone, and everything we sent over was approved right away. 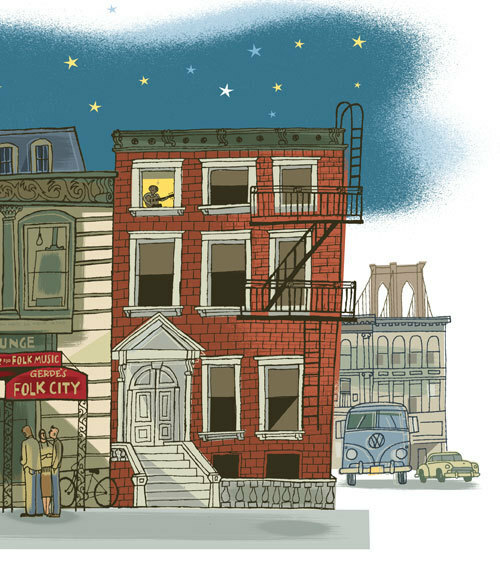 This drawing shows a block of Greenwich Village that includes clubs Dylan played in when he first arrived in New York. Café Wha? 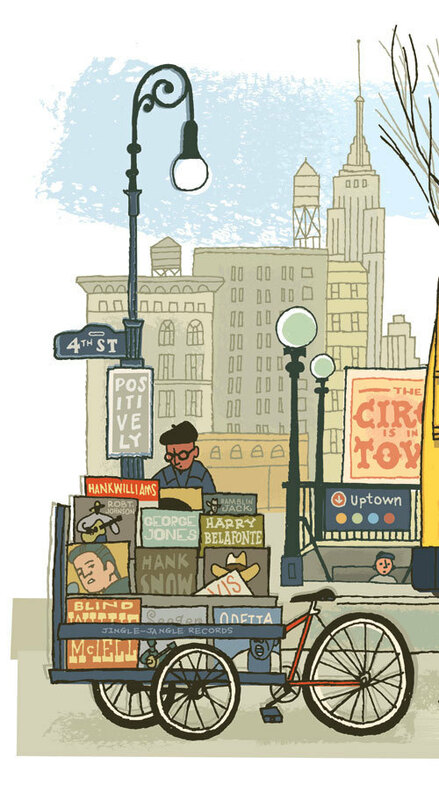 was a pass-the-hat joint, and Dylan says he spent a lot of time in the NY Public Library. I found a photo from the sixties of this cat’s sidewalk record stand that he rigged up from a bicycle, so I filled it with records that Bob plays a lot on Theme Time Radio Hour. 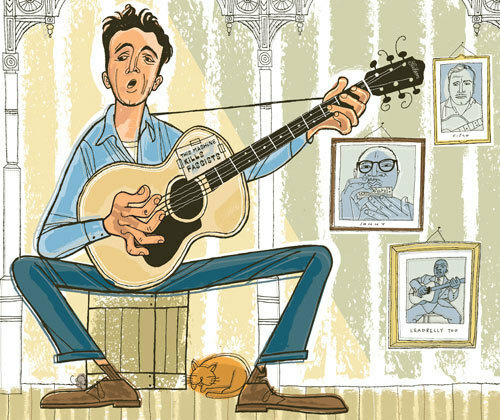 Woody Guthrie’s influence on Dylan was immeasurable, the first song Bob wrote was “Song to Woody” and he name-checks Cisco, Sonny and Leadbelly too. This illustration was an early style exploration that didn’t make it into the book. 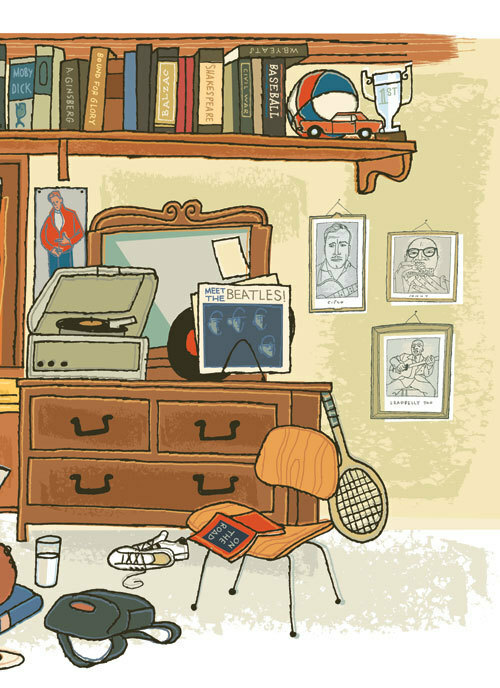 The kids room is loaded with references to many things and people Dylan mentions in his memoir Chronicles Vol 1. The portraits of Cisco Houston, Sonny Terry, and Leadbelly found a place. All good illustrators know not to throw anything away, and to never draw something you can trace, and never trace something you can cut out and paste down. 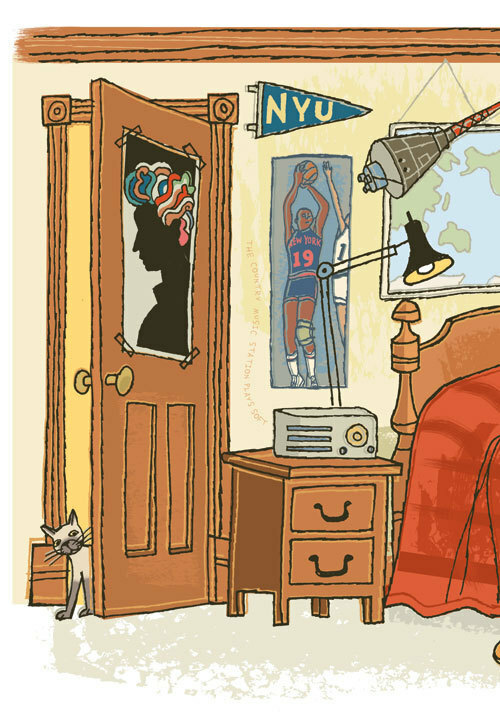 Milton Glaser’s poster shows up next to Willis Reed. The radio has words coming out of it that read “the country music station plays soft,” a line from Visions of Johanna. I tucked some tiny handwritten lines into a number of the illustrations. 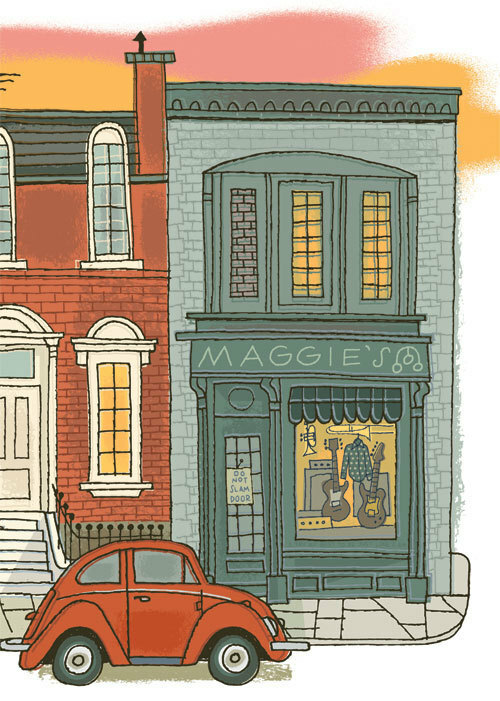 Maggie’s Farm becomes a pawnshop with electric guitars and a polka dot shirt in the window. 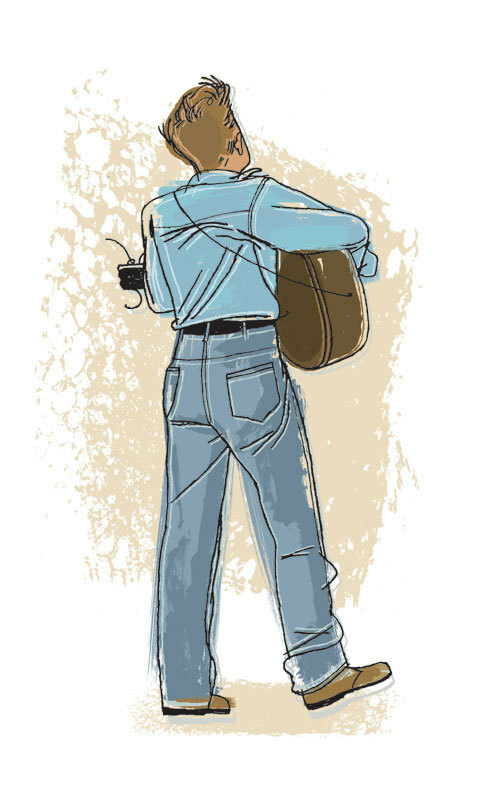 This drawing of Dylan was done for the endpapers, but we didn’t use it. 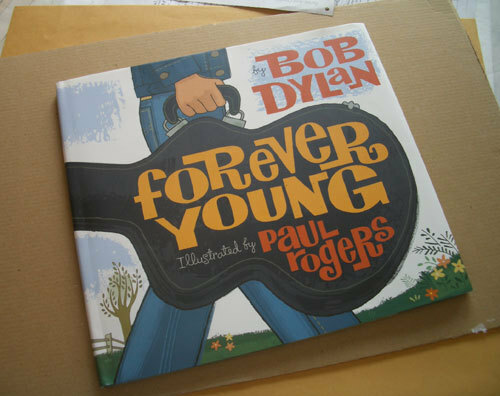 I just received an advance copy of “Forever Young.” Last year, Ginee Seo and Ann Bobco at Simon and Schuster/Atheneum Books called to see if I’d be interested in working on a children’s book based on the lyrics to Bob Dylan’s song. They didn’t have to ask me twice. 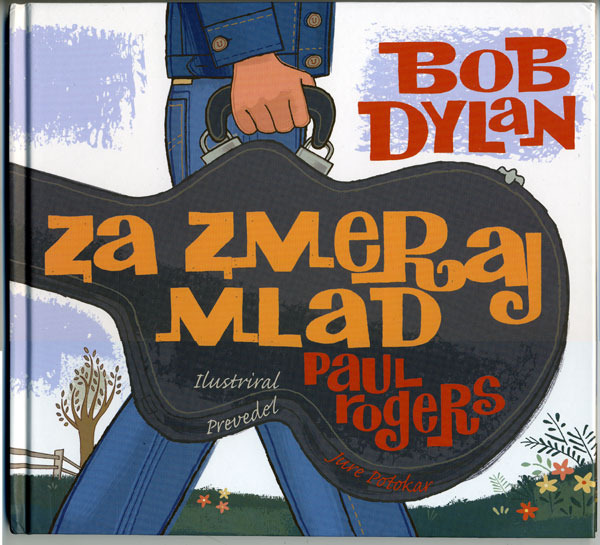 This is one of Dylan’s most loved songs and my job was to not screw it up, and to do something that Bob would like. I’ll post some more about the book when it’s released in September. Publisher’s Weekly has called the illustration style “chilly.” Just what I was aiming for. It makes a nice gift.